Children nowadays take energy for granted. Could you image having to come home from school and to chop wood for dinner or to keep warm? If you have you know how monotonous and boring the experience is. In my report I will be discussing the most important discovery, known to man, fossil fuels , and changing them into energy. Some people may disagree with my last statement saying that fossil fuel are terrible and have destroyed our environment. In my report I will give you an analysis of both points of view. I will also suggest some things we as a community can do to cut down the pollution from these fuels. You may be asking yourself, where does coal come from? Coal is the remains of dead plants and animals becoming fossilized and over millions of years they decompose and through great pressure and high temperature these fossils change to coal. Coal makes up approximately 28% of the worlds total energy needs, and is consumed at an alarming rate with nearly 1 million tons of black coal burnt in Australia in one day, and is worth about $5 billion annually just to Australia. But coal is unrenewable an it is predicted the worlds coal reserves would be gone within the next 40-50 years. Coal is one of the most important discoveries know to man, as I mentioned before. Coal basically started the industrial revolution, in which created the whole way of life as we know it now. Light in our homes, refrigerators to keep our food fresh and ovens to cook our food are all came indirectly from the discovery of coal. 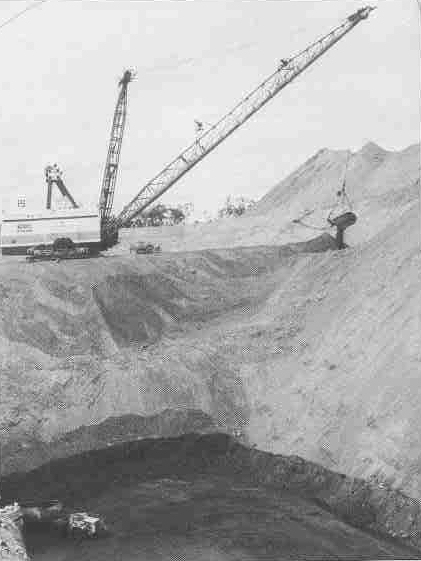 Shaft mining for Black Coal, in Newcastle, NSW. Oil is formed a lot like coal except coal is found on land and oil is mainly found in the ocean. Oil forms from dead plant and animal life drifting to the bottom of the ocean and it there is covered with sand and sediment material. Over thousands of years due to high temperature and pressure these fossils form oil. Oil is mainly used in developed western countries such as Australia, Canada, USA and some European Countries, who mainly use oil for energy and fuel for automobiles. Oil is a precious commodity and it is very expensive. It is believed that the worlds oil reserves will run out within the next 40-50 years. Oil is so valuable that is was the main reason why the Gulf War began. As it is so expensive underdeveloped countries can sometimes not afford it even though they desperately need it for transport, which stops their countries growth. Oil ships can carry up to 500 000 tons of oil. So as you can image if one of these ships started to leak it would have a serious detrimental effect on the environment. Oil spills can cover a massive area. For example in 1989 the Exxon Valdez oil spill Alaska covered 13.5kms by 6.5kms. It took a long time for this region to recover. To prevent oil spills, I feel oil companies must be so accurate that every part of the tanker is leak proof. There should also have a clean up crew ready if there is a oil spill. When oil and coal is burnt they emit huge amounts of carbon dioxide and other harmful gases, that have a negative effect on the environment, like sulfur dioxide. Carbon dioxide traps in the sunlight as it only lets light in, it does not allow it to leave the atmosphere which causes temperatures to rise. If temperatures are too hot it is terrible for children and elderly people who find it hard to cope with hot conditions. To stop the green house effect we must find alternative transport. Did you know that for every liter of petrol used 3 kilograms of carbon dioxide is released into the air. If you multiply that that by the average amount of petrol a car uses in a lifetime and multiply that by the number of cars that have been on the streets you have a lot of Carbon dioxide in the air. Coal and Oil also let off sulfur dioxide which mixes with the moisture and clouds in the air and forms sulfuric acid. The sulfuric acid is know as acid rain as when it falls it causes forests, vegetation and crops to die, which upsets the equilibrium of many ecosystems. Acid rain occurs in Australia but is not as bad as in Europe where some of he most beautiful forests in the world are dying as a result of acid rain. With these effects in mind and the fact that fossil fuels are predicted to run out within the next 40-50 years it is essential that we find alternative and renewable energy sources. I will now give you some information about the three main renewable resources which may be the answer to our energy crisis. Water energy was first pioneered by the Greeks and Romans from 300 B.C They used waterwheels to grind seeds to make flour. During the industrial revolution water wheels were used in the textile industry and in Australia waterwheels where used in the early 20th century in the production of gold. Energy which comes from water is called hydro-electricity. Hydro electricity is becoming a prominent figure in the worlds energy source's. Brazil obtains 92% of it's power from hydro electricity. Australia only has 15% but is regarded to have one of the great hydro electricity systems in the world in Tasmania called the Snowy Mountain Scheme. Although hydro electricity is an excellent source of energy it sill has some side effects. To set up a hydro electricity center you must clear a lot of vegetation which upsets ecosystems. This is the main reason why it has not been further developed in Australia but hopefully we can use our wide open spaces so this effect is non-existent. 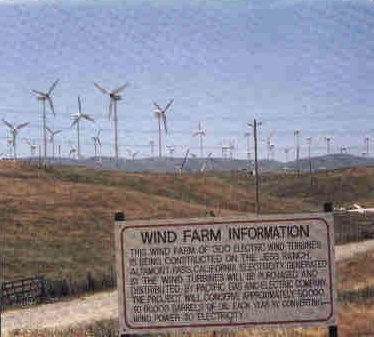 Wind energy believe it or not has been around for centuries. Wind was used by early explorers to assist them on there great exhibitions. Also it is believed that windmills were existent in China as long ago as 2000 B.C . Windmills were also used in Europe during the 10th century. As Australia is so big it is hard to get electricity to all parts. That's why wind power is vitally important to Australians, especially farmers. Wind energy is also very cheap to get. A huge Wind Farm in southern USA. Solar energy is the most advanced form of energy out of all the renewable energy sources. It is believed by many to be the best alternative energy source for the future. It involves no side effects to the environment. Appoximentley 25% of all households in W.A have solar powered hot water which is a very incorrigible statistic. Solar hot water systems work by solar panels absorbing light from the sun which intensifies and heats up water in pipes behind the panel. This water is then transported to places where it is needed. Solar power I feel is really the future of electricity as it has no side effects. Right now it solar power is still fairly expensive but as the price of fossil fuels go up because of the scarcity of the product and the price of solar power drops due to technological advances means that most Australia home will sooner or later have solar power. I think our goal should be 75% of all houses in Australia to have solar power by 2020 which is a reasonable expectation. 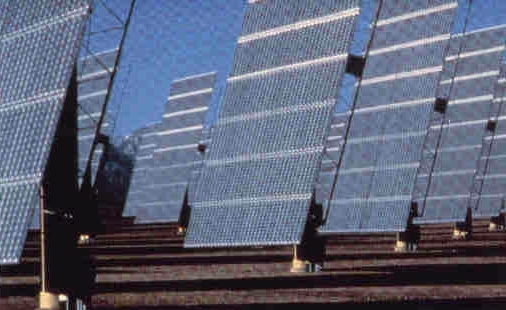 Solar Collectors, at a solar power station in California, USA.